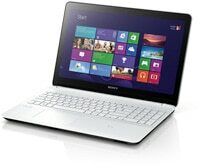 Sony’s Vaio Fit range of laptops all run Windows 8 and come with NFC. Fit 15 models come with a 15-inch 1080p display, while the smaller 14-inch Fit 14 devices start at 1,600 by 900 pixels. All Fit laptops have NFC and backlit keyboards. They’ll be available this month, according to Engadget, starting at US$550 and going all the way up to $2,210. Engadget has reviewed the Fit 15 here.